The creative and tech sectors are two of the UK’s most exciting and dynamic for exporting. In the sixth of a series of case studies looking at businesses carrying the flag for the UK overseas, we look at The Travelling History Company. Who are The Travelling History Company? The Travelling History Company is a project designed to encourage engagement with the British historic landscape. We design accompanied outings to typically less well known historical sites and landscapes throughout the United Kingdom. We work with individuals, families, schools, cubs and beavers, universities, tourists and companies. We inform, engage and inspire young and older people alike. For children we arrange inspirational activities, all our trips are to non commercial sites free from entry fees and gift shops. Our “Prehistory for Professionals” project involves evening tours usually accompanied by a trip to a fine country pub. Our work with cub and scout groups and schools, help students towards badges or supporting the curriculum with fun and immersive history. In the winter months we run an awesome historical astronomy programme, replicating the discoveries of the great 17th and 18th century astronomers. We also run “astronomy from ancient places” trips, observing the night sky from prehistoric sites. Our China interest involves studying the ancient Chinese night sky and the “archaeology” that can be found in the night sky. We are based in the West of England, explore our website and contact us if you would like more information or to book an outing. 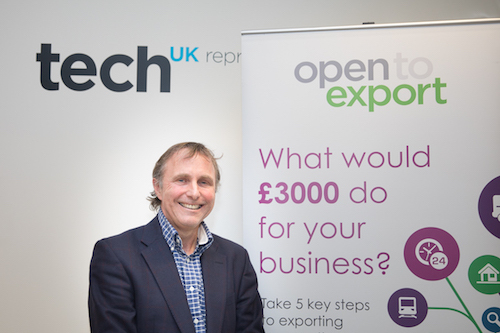 We’re very early in our export plans, just getting started really – the company was only started last year. We’re in cultural tourism – we take families into the English landscape and give guided tours of the historic landscape. I didn’t do it for the competition itself but because it seemed like a good idea to plan – a good way of getting my head clear. I had lots of ideas and wanted to think them through properly and get them down on paper. I was actually talking to someone at the DIT and it was really useful as something to give to her to show where I am and what I need help with. It’s been great, I’ve really enjoyed it. It’s really interesting to learn about what other people are doing and it’s good to meet people too. Doing the presentation is also good for focusing the mind and the judges’ questions were useful for seeing what people think about this crazy idea of mine!